I smiled to myself and thought it was sweet but also appropriate as “Out in The Backyard” is a song about playing with a shovel and a pile of dirt. He sang those four lines then splashed deeper in the water to “surf” with Daddy. It was a special moment I will always remember. Our afternoon at the beach was filled with many special moments. As we drove away I closed my eyes and smiled in gratitude; grateful for my family, our music, the sun, the waves and the sand. We went out for dinner the other night and when the server brought a plate of edamame to our table Owen’s face lit up with a huge grin and he called out “edamame” and clapped his hands in delight. He then gobbled down the edamame one after another practically non-stop. He has always liked edamame but the day I gave him a little pile of full pods instead of shelling the beans for him, well that day edamame shot way up to the top of the list of his favorite foods. Inspired by the excitement he showed over the edamame I made up a little song. 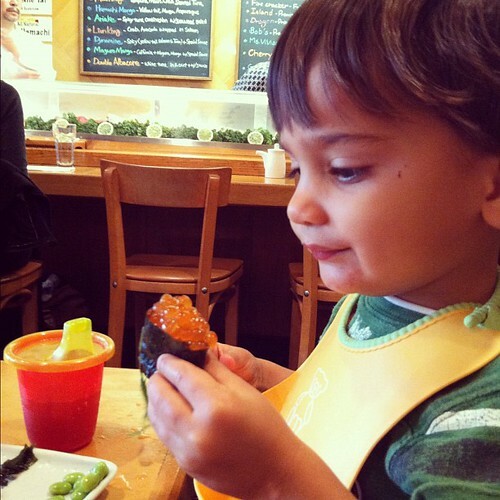 We sing it at dinner sometimes especially when we are having…EDAMAME!